George Hare (born 1825, died 1913) was a joiner from Yorkshire. After working in York he moved to London were he joined camera maker Thomas Ottewill's company. In the mid-1850s he founded his own firm. 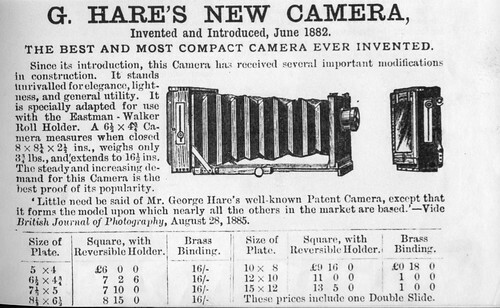 It made a great variety of fine wooden view cameras. One known address was 26 Calthorpe Street London. This page was last edited on 28 October 2018, at 09:15.